Smith's 3-in-1 sharpener can handle all of your sharpening needs. It features pre-aligned carbide blades, which are reversible and replaceable, for quick edge setting capabilities. The fine 750-grit interrupted surface Diamond Stone provides a quick razor sharp edge on any knife or tool. A pair of specially shaped teardrop ceramic rods provide multi-use sharpening capabilities, everything from standard to serrated edges along with hooks and tools. The protective storage lid also serves as a hand guard, and the ceramic rods fit securely into a compartment in the bottom of the base for safe and easy storage. System. 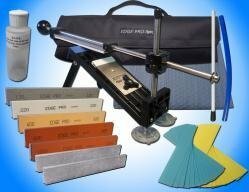 Includes one each of the following Arkansas Sharpening stones: soft (300 grit equivalent), hard (650 grit equivalent) and black hard (1,200 grit equivalent). 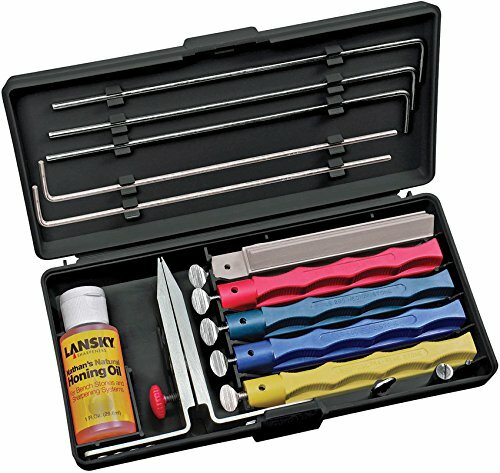 Sharpening system comes with precision multi-angle, flip-over knife clamp with rubber-padded jaws to prevent scratching; sharpening stones on color coded finger grooved safety holders; one guide rod for each stone; specially formulated honing oil and extra long knife clamp screws. Sharpening angles include 17°, 20°, 25° and 30°. Black custom molded storage/carrying case holds all. Includes complete easy-to-follow multi-lingual instructions. Hang packaged. The Apex Model Edge Pro is a patented system that will sharpen any size or shape blade (up to 3 ½" wide), including serrated knives. Knives can be sharpened at exactly the same angle every time, making re-sharpening so fast you will never work with a dull blade again. Edge Pro water stones have been custom formulated to free you from messy, gummed-up oil stones. They last a long time and are inexpensive to replace. The Apex will remove far less metal than electric sharpeners or grinders, eliminating wavy edges and adding to the life and performance of your knives. You will get reliable, consistent results, and a mirror finish that shaves with this system. Full instructions and DVD are included with the kit. Includes coarse, medium and fine hones. 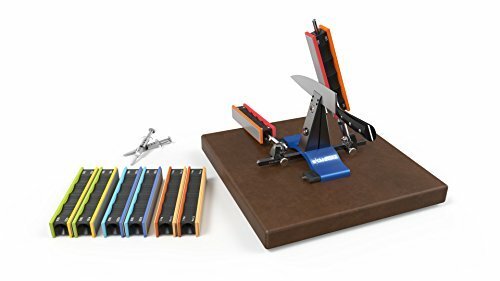 Each sharpening system comes with precision multi-angle, flip-over knife clamp, sharpening hones on color coded finger grooved safety holders, one guide rod for each stone, specially formulated honing oil and extra long knife clamp screws. Custom molded storage/carrying case. Includes easy to follow instructions. Includes coarse, medium, fine, and ultra fine grit standard hones and medium grit serrated hone. 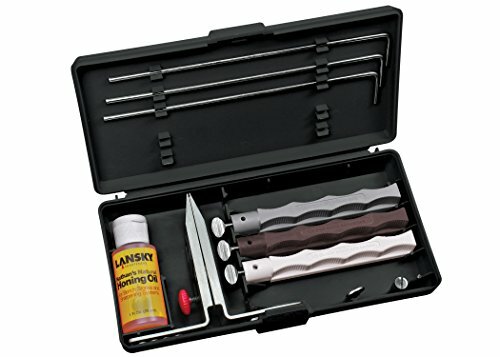 Kit also comes with: 1 fluid ounce bottle of Nathan's Honing oil; knife clamp with angle selector; five guide rods; and red custom molded storage/travel case. Hang packaged. 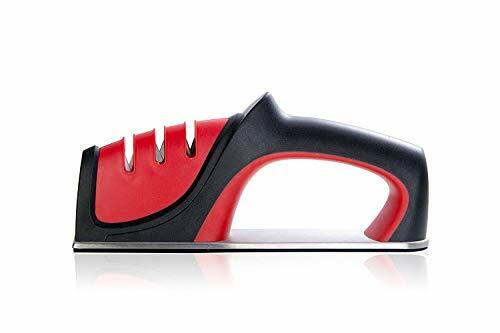 Specification Product Weight：218g/7.62oz Product Size：21.5*5*9.5cm/8.46*1.97*3.74" Material: ABS Plastic,430 Stainless steel,Diamond,Tungsten steel and ceramic 3-in-1 Knife Sharpening System will meet your different sharpening needs. 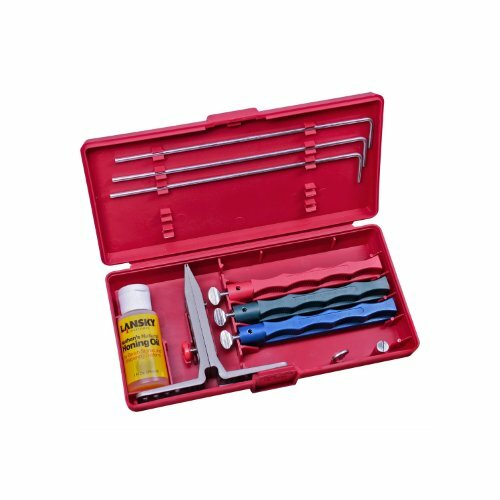 Diamond Rod: To repair and straighten damaged metal blades. Tungsten Steel Blade:To coarsely sharpen and restore the V-shape cutting edge of metal blades. 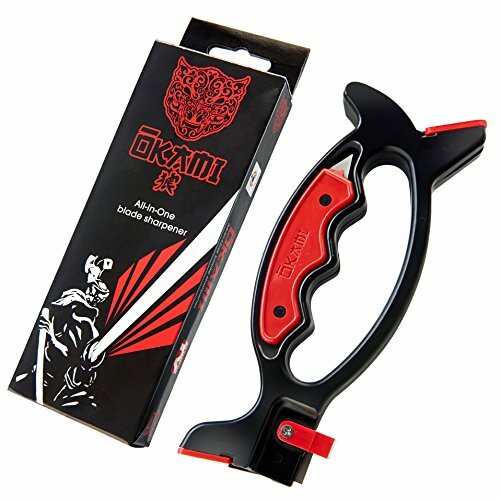 Ceramic Rod : To finely sharpen,polish and eliminate burrs on the metal blade. NOTICE 1.Don't use this sharpener for serrated knives, ceramic knife and scissors. 2.Don't push and pull your knife back and forth. Use one direction only. 3.Don't apply heavy downward pressure, or it would damage your knife. 4.Please keep the sharpener and knife out of reach for children to avoid accident. 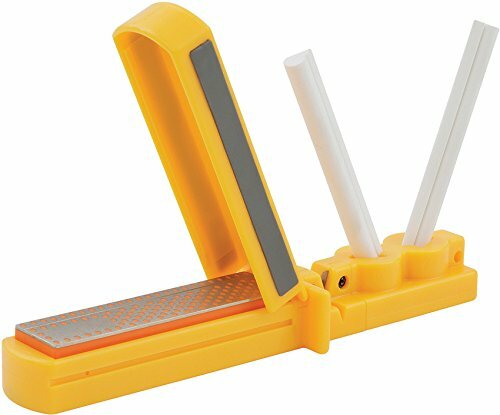 Edge Pro Apex 1 Sharpening System - Hand Sharpening DIY Full Kit w/Stones New! 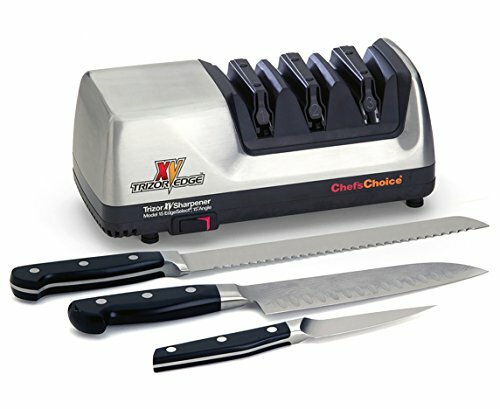 Shopping Results for "1 Sharpening System"